(Report - 6 April 2017) For the second consecutive year the Aintree Sale demonstrated a vibrancy at the top of the market that rivals any sale at any location as Gold Cup winning owners Alan & Ann Potts bid £300,000 for the Irish Pointer Madison To Monroe. Colin Bowe’s Milestone Stables sold the sale topper last year, the unbeaten Samcro, and once again topped the sale with Madison To Monroe (Lot 20 - pictured). The four-year-old son of Presenting won his debut Point-to-Point at Monksgrange on 26 March and was bought by Tom Malone on behalf of this year’s Cheltenham Gold Cup winning owners Alan & Ann Potts. Donnchadh Doyle’s debut winning Pointer, Some Man (Lot 9), a close relation to Denman, claimed the second highest price of the evening when selling to Highflyer Bloodstock for £165,000. Tom Lacey’s UK Pointer Blackbow (Lot 16) also proved a highlight when selling to Harold Kirk and Willie Mullins for £150,000. 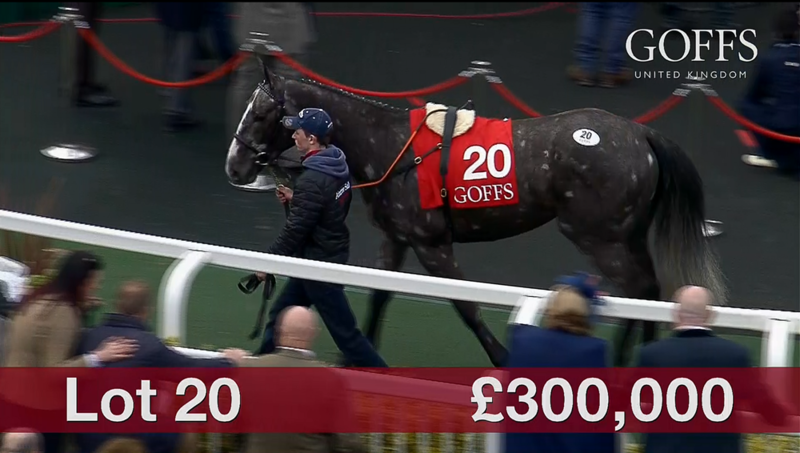 Grand National entry Just A Par sold to leading trainer Paul Nicholls for £100,000. Dr Peter FitzGerald, founder of 2017 Grand National sponsor Randox Health, was also on the buyer’s sheet, purchasing Virginia Considine’s Royal Rendezvous (Lot 7) for £130,000.